The pretty outline of the Amish Western Red Cedar Royal English Glider will catch they eye of many and the custom comfort of a relaxing ride will have them spending time outside. Bring home the ultimate in outdoor seating with this beautiful combination of rocker and swing. This cedar outdoor furniture is sure to please on your patio, porch or pool area with its comfort factor and cozy style. Enjoy your afternoon drink in the backyard or your latest novel out by the pool with this Royal English Glider providing a luxurious rock and sway! Surprise a loved one with an outdoor glider as a gift. This outdoor wood furniture is perfect for the new homeowner or newly married couple. Cedar wood is brimming with benefits like its natural resistance to decay and its versatile style. The fresh scent of cedar naturally wards off bugs and its lightweight makes it easy to transport. A seat like this is fit for royalty. With customization options offering you choices, it's easy to create the outdoor furniture you envision. Pick the length that's right for your home. We offer a 4', 5', or 6' length. 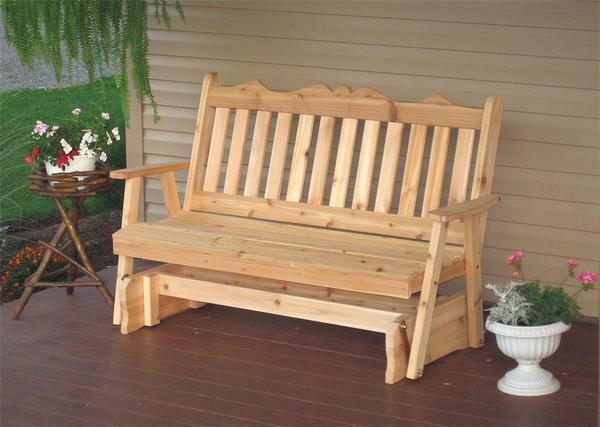 Made of solid tight knot Western red cedar wood, this outdoor furniture is built to last. Hardware is zinc plated to resist rust. We offer a variety of stains for you to pick from. View and order samples to consider. Add cedar cup holders at the ends of your glider to keep beverages near. Create the color scheme you like with durable Sundown fabrics for seat cushions and accent pillows.